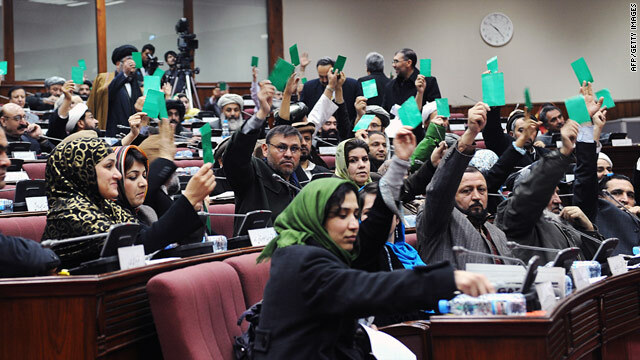 Afghan parliament members take a procedural vote Saturday before voting on President Hamid Karzai's Cabinet appointments. Kabul, Afghanistan (CNN) -- Afghan President Hamid Karzai's second attempt to seat a new Cabinet failed Saturday with the parliament rejecting a majority of his selections. The parliament approved seven ministers out of 17 nominees. They include Karzai's former national security adviser, Zalmai Rasoul, as foreign minister and Amina Afzali, one of three female nominees, as social affairs chief. Nominees for ministries of Justice, Haj and Islamic Affairs, Economics, Counter-Narcotics, and Rural Rehabilitation and Development also were approved. But the rejection of 10 names does not bode well for Karzai, who is under both international and domestic pressure to stamp out widespread corruption in Afghanistan and establish legitimacy for his administration, tainted by allegations of vote fraud in August. Among those rejected were candidates for higher education, public health and women's affairs. Parliament members have complained that Karzai's nominees are either corrupt or linked to warlords. Meanwhile, 14 militants and three international troops died in fighting over the past 24 hours in Afghanistan, authorities said Saturday. A "sizable amount" of black tar opium and a small weapons cache and bomb-making materials were found in the operation, it said. In eastern Paktika province Friday night, forces called in an airstrike against militants planting roadside bombs, the NATO-led mission said. Three militants, including a commander of the Haqqani network, were killed. In Khost province, north of Paktika, a roadside bomb Saturday struck the vehicle of the Bak district's sub-governor, who suffered minor injuries. The British Defense Ministry said two British soldiers were killed while on foot patrol Friday in Helmand. The NATO command said an ISAF service member was killed Saturday but didn't list the nationality or location of the incident.